The magnificent "pink palace" of Drumlanrig Castle can be found some three miles north of Thornhill, and seventeen north of Dumfries. It is reached from the A76 via a road that leads through the castle's extensive estate before bringing you to the north end of the Great Avenue, the tree lined drive that approaches the castle from the north. The car park is conveniently located for the visitor reception, and from here you can take a guided tour of the castle, or explore the gardens and grounds. Drumlanrig Castle is less well known and less visited than it deserves to be. The castle itself offers one of the best and most interesting visitor experiences you are likely to find anywhere, and the extensive and very varied formal and informal gardens are well worth a visit in their own right, or a return visit if you've already seen the castle. The gardens are the subject of a separate feature page. You could easily spend a day at Drumlanrig without feeling you'd seen all there was to see. The story of Drumlanrig Castle is very much the story of the Douglas family, who were successively Earls of Douglas then Earls and later Dukes of Queensberry, and more recently the Dukes of Buccleuch and Queensberry. The castle's location is of strategic importance, as it controls routes from the north and north east into Nithsdale, and it seems the Earls of Douglas had built a stronghold on the site by about 1430. This first castle had been redeveloped into something worthy of the description of a "hall house and palace" by the mid 1500s. Plans were drawn up in 1618 for a major rebuild, but nothing happened on the ground until work began on the building you see today in 1675. 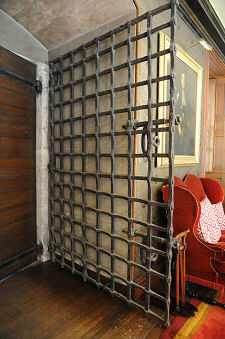 This was the brainchild of the 3rd Earl of Queensberry, who later became the 1st Duke of Queensberry. It seems likely that the design owed at least something to the work of the architects Robert Mylne and Sir William Bruce, and there are strong similarities with the contemporary Baroque design of George Heriot's Hospital in Edinburgh. Rome wasn't built in a day, and neither was Drumlanrig Castle, which only appears to have been finally completed in 1697. At the height of the work during the summer of 1684 it was recorded that there were 31 masons and 8 wrights working on the project, together, doubtless, with large numbers of less specialised artisans. The east wing of the earlier castle was incorporated into the structure of the new castle, but not in a way that is externally obvious to the untutored eye. The rest of the earlier building appears to have been demolished and, presumably, its stone was recycled into the replacement structure. It is thought that what emerged over a 22 year building period was not quite what was originally planned, and there are indications that a number of elements of the design were changed as work progressed. 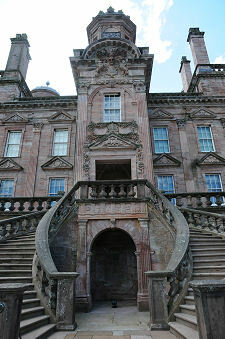 It certainly seems possible that features from other buildings being constructed at the time in and around Edinburgh influenced the development of Drumlanrig as it was built, most notably the Palace of Holyroodhouse. Perhaps the best place to get a true sense of the length of time the castle took to build is in the central courtyard. This has a circular stair tower that protrudes into each corner of the space, and the stone immediately above the window in each stage of each tower is dated. As a result we can see, for example, that the stages of one tower were completed in 1684, 1687 and 1687, while the lower two stages of another were both completed in 1679, and still yet another carries a date of 1681. Other than (obviously) higher stages always carrying years that are the same as or later than the stage below, there doesn't seem any obvious pattern to the progress that took place. Drumlanrig Castle in 1697 must have stood out rather more stridently from its surroundings than it does today. Its impact has been softened by centuries of tree plantation in the wider estate (despite the efforts of William Douglas, 4th Duke of Queensberry, who at the end of the 1700s cut down many of the estate's trees to sell off as timber to help pay his gambling debts), by the development of formal and informal gardens, and by the knowledge that the castle is now the oldest thing in its landscape. Early visitors were not always complimentary. Daniel Defoe, in an account of "A Tour Thro' the Whole Island of Great Britain" published in 1726 noted that "We could not pass Dumfries without going out of the way upwards of a day, to see the castle of Drumlanrig, the fine palace of the Duke of Queensberry." He went on, however, to say that: "Drumlanrig, like Chatsworth in Darbyshire, is like a fine picture in a dirty grotto, or like an equestrian statue set up in a barn; 'tis environed with mountains, and that of the wildest and most hideous aspect in all the south of Scotland." Perhaps the landscaping was still a little raw, or perhaps Defoe, like many of his time, was not comfortable in an environment that even hinted at being mountainous. 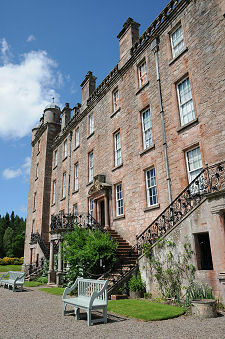 There have been numerous changes to the internal layout and external detailing of Drumlanrig Castle during its lifetime, but despite this the building does succeed in giving a sense of unity: you get the feeling that if the 1st Duke of Queensberry were to visit it today, he's probably feel that the building he created had been reasonably well treated by those who followed. An example of this can be seen in a courtyard near the old stables, where a cupola taken from the roof (and in very poor condition) is on show. This has stood here since 1995, when a 17 year project to replace the entire roof of the castle was completed. The roof is not expected to need further work until 2170. The castle was used as an auxiliary hospital during the First World War, and housed the girls of St Denis School, relocated from Edinburgh, between 1939 and 1945. It has otherwise served the Douglas family as a home throughout its life, and one of its many charms today is that it still has the feel of (and is still sometimes used as) a family home, even though the main family residence is now elsewhere in the area. Other notable, if more temporary, residents have included Bonnie Prince Charlie who spent a night in what is now (inevitably) known as Bonnie Prince Charlie's Bedroom on 22 December 1745, en route to his date with disaster at the Battle of Culloden. He left in such a hurry that his money box was left behind, apparently screwed to the floor. The same bed was slept in by Neil Armstrong, the first man on the Moon, when he stayed at Drumlanrig in 1971. It is perhaps a shame that the room cannot be renamed "Neil Armstrong's Bedroom", in recognition of an ex-resident who actually achieved something worthwhile for Scotland (and humanity more widely). 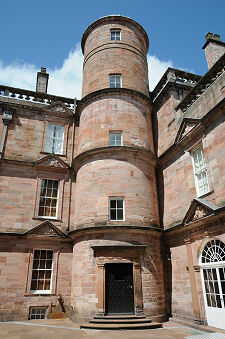 The visitor reception is at the end of the right hand (as you look at it) wing projecting forward from the north face of Drumlanrig Castle. From here you begin a tour that takes visitors through all the important areas of the castle, while maintaining interest throughout. You start in the hall that lies behind the main door on the first floor level of the north face of the castle (whether this is the front door or the back door seems to be a matter of some debate). This room is separated from the central courtyard by a series of arches, and when the castle was first built it served as a "loggia", and was open to the elements on the courtyard side. Today it makes a wonderful room. It's worth looking at the the carpet in the hall. This carries the winged heart motif that serves as the family's emblem and is in evidence wherever you look at Drumlanrig: carved into exterior walls; incorporated into ceiling plasterwork; and repeated in other decoration in just about every room. The story of the winged heart emblem has a certain grisly romance and is worth repeating. When King Robert I of Scotland, better known as Robert the Bruce, died on 7 June 1329 he had achieved almost everything he had set out to achieve, and Scotland was once more an independent sovereign state. But he had never found the time to go on crusade. So when Robert I was buried in Dunfermline Abbey, his heart was, in line with his dying wish, placed in a silver casket and carried by Sir James Douglas on a journey to fight against the Moors in Spain. Sir James was killed in battle, but Robert's heart was returned to be buried in Melrose Abbey. And the Douglas family have ever since used the winged heart as their emblem. 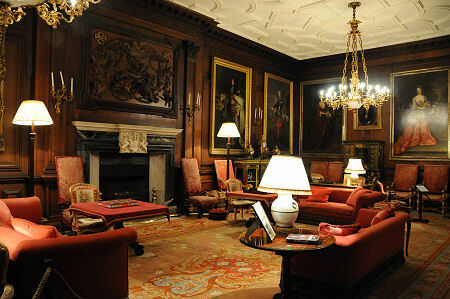 From the hall you pass through an ante room, whose furnishings include a clock once used in the (now ruinous) Morton Castle, and the morning room. Both are rooms on a very human scale, and it is easy to imagine people enjoying these spaces, complete as they are with family mementos. The dining room is designed on a much larger scale, and comes complete with beautiful wood panelling and large family portraits. The serving room beyond it is particularly fascinating, as its walls are lined with paintings of servants including, most strikingly, the chef Joseph Lawrence, who served three Dukes. Moving up a level takes you through Bonnie Prince Charlie's Bedroom and its striking tapestries to a beautiful ante-room beyond. The highlight here is another wonderful tapestry, this one including three tigers playing in the foreground. Only... the scene was meant to be a Scottish one, and those are meant to be Scottish wildcats (not with those tails they aren't). It would seem the weaver had no reference for a wildcat, so went for tigers instead. Moving on, the drawing room is in many ways the highlight of your tour of Drumlanrig, a magnificent room made all the more atmospheric by the need to exclude the fading effects of daylight. You then move through the staircase gallery to the boudoir and the white bedroom, before descending to your starting point. 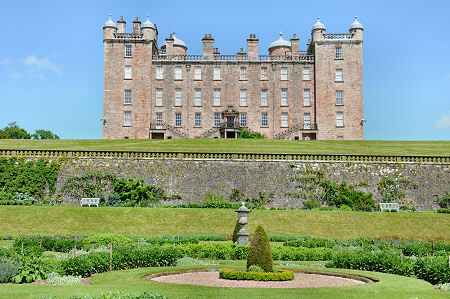 Drumlanrig Castle, Thornhill, DG3 4AQ.